Soak the onion in a small bowl of ice water, about 5 minutes. Make the dressing: Whisk the vinegar, pepperoncini or olive brine, garlic, 1/2 teaspoon salt and 1/4 teaspoon pepper in a large bowl. Whisk in the olive oil in a slow stream until blended. Drain the onion and add to the bowl with the dressing. Add the lettuce, herbs, tomatoes and cucumbers and toss to combine. Season with salt and pepper. 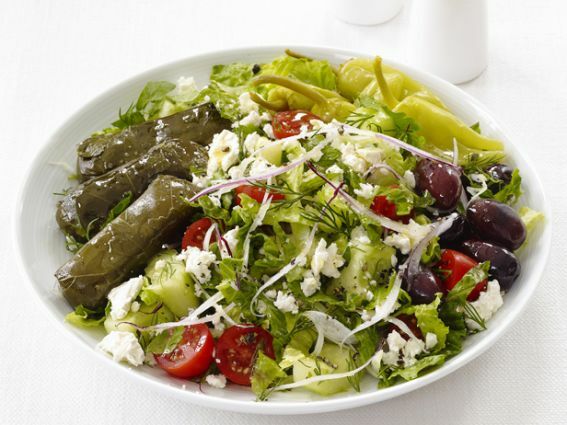 Divide among bowls and top with the pepperoncini and/or olives, feta and stuffed grape leaves. Per serving: Calories 338; Fat 27 g (Saturated 8 g); Cholesterol 33 mg; Sodium 1,018 mg; Carbohydrate 16 g; Fiber 4 g; Protein 9 g. Makes 4 servings. Strawberry Baby Spinach Salad with Fetta & Almonds. My Salad Recipes Copyright © 2019.